Sensational turnaround, great product, well priced. Cable Chick does it well. Welcome to your complete guide the everything HDMI. This beginners guide to HDMI Cables and standards is a must-read for anyone looking to better understand the new HDMI Digital AV connection standard. HDMI is the latest technology standard for creating high–bandwidth connections to transmit digital data between digital devices. HDMI was developed by a consortium of leading electronics manufactures including Sony, Toshiba, Hitachi, Panasonic, Phillips, and Silicon Image. Since its introduction into the consumer electronics market in 2003 HDMI has experience a rapid rate of adoption even though there is a lag in the move towards HD content. The latest HDMI standard is version 2.0 which was released in September of 2013. However, most devices in the market do not as yet support the additional features of the latest HDMI standards (as of this writing). What Is A HDMI Cable Used For? HDMI technology is used predominantly to transmit High Definition video and multi–channel audio between digital devices over a single cable. HDMI can be found in a range of late model consumer electronics including Plasma and LCD screens, Blu-ray Disc players, AV receivers, set–top boxes, personal computers (PCs), video game consoles, and Camcorders. HDMI is the Digital alternative to traditionally used analogue signals such as VGA, Composite Video, S–Video and SCART. For more information on why HDMI is the popular choice for HD cabling solutions watch this YouTube clip – Watch now. A HDMI cable uses TMDS (Transition Minimized Differential Signalling) technology to encode and transmit data between digital devices. TDMS acts to protect data from deterioration as it travels through the copper cables to its destination. HDMI cables are able to transmit uncompressed data without the need to convert content to an analogue signal between devices as was necessary with other older interfaces. Because no conversion is required there is no deterioration of video quality; Images are smoother and sharper whist audio is crisp and without distortion. This is partly why HDMI is popular for use between HD devices. HDMI technology transmits all digital audio and digital video signals via the one high–speed cable. Whilst HDMI cables allow for two way communication between devices, HDMI ports currently only allow for information to be sent in the one direction (however the modern HDMI, from version 1.4 onwards, allows for upstream signals to be passed from port to port - known as Audio Return Channel). With the right setup, HDMI can make a significant difference in a home theatre system. Watch this YouTube clip to view the difference HDMI can make to your home theatre setup - View. What Is HDMI Compatible With? HDMI is compatible with DVI (Digital Visual Interface) for video only. HDMI is basically an updated version of DVI. Because both DVI and HDMI use the same digital signals, no conversion is necessary when connecting a DVI device with a HDMI device. Further more there is no loss data quality when using an adaptor. HDMI has been designed as an evolving technology. As such it is expected to be compatible with most future technologies. HDMI supports all current video format standards in resolutions ranging from 480p to 1080p and on up to 4K. Cable Chick has a range of HDMI connectors and DVI-to-HDMI adapters available. Are There Competing Technologies To HDMI? DisplayPort is the primary competitor to HDMI technology - it's more of a complimentary standard targeted at computer systems, but occasionally they compete for market share. DisplayPort is NOT compatible with HDMI in both directions or on all equipment. If you require a DisplayPort Cable, Cable Chick also has a range of these available - and check out our blog on DisplayPort for information on this equally amazing digital standard. It is estimated that as of 2013, 1000 million devices were in circulation that employ HDMI technology. 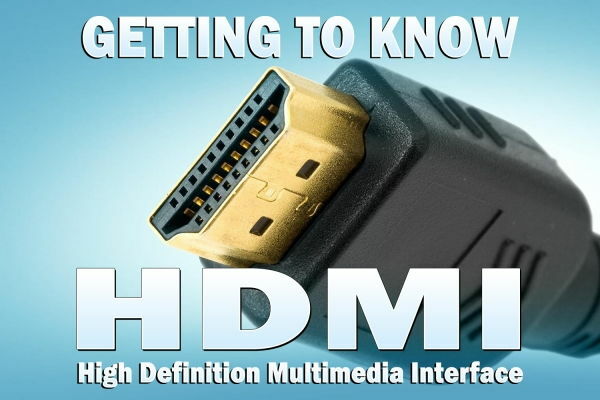 This rapid rate of adoption is expected to see HDMI become a more universal standard of connecting HD devices. HDMI is strongly supported by industry for a number of reasons including, the inclusion of HDCP (High-bandwidth Digital Content Protection), the ability to evolve with the changing technologies in consumer electronics, and because HDMI is easier for consumers to use. For example, only one HDMI cable is required where previously several various cables were needed. Typically it is recommended that HDMI cables don′t exceed 20 meters to ensure the integrity of data is retained and a high quality output is achieved. However, by using quality HDMI cable, HDMI amplifiers, and HDMI extenders it is possible to use cable lengths in excess of 250 meters. We stock a 40 metre HDMI cable that has an integrated signal booster - analogue could never go that far! Can all HDMI cables handle 4K? All of our cables are rated as High Speed with Ethernet, meaning that they all have 3D, 4K, ARC and internet sharing compatibility. However, since longer cables offer more electrical resistance and electrical resistance lowers available bandwidth, longer cables have trouble maintaining functionality under certain circumstances. For direct connections between powered source devices and displays over short lengths, even a basic HDMI cable will do. For longer lengths or connections to splitters or switches, higher quality cabling is needed to maintain bandwidth. Similarly, source devices which don't have the power to output a strong HDMI signal (especially battery powered devices) may be limited to short HDMI cables in order to maintain full resolution. The farther you go, the more you should spend to ensure the best possible performance in adverse conditions. Cable Chick offers a variety of premium HDMI Cables for sale in a range of lengths from 0.5m to 40m. Buy HDMI Cable at Cable Chick. Wikipedia entry on HDMI - Visit. Got a question about HDMI Cable? Or maybe you have some advice? Contact us a: https://www.cablechick.com.au/contact/.